Une Droite ayant une morale: Trump faces 'open warfare' with Breitbart, it would get ugly. Trump faces 'open warfare' with Breitbart, it would get ugly. A former Breibart executive has warned it will be “open warfare” against Donald Trump’s team if his son-in-law Jared Kushner forces out Steve Bannon following reports of a fierce West Wing feud. Chief strategist, Mr Bannon, who founded the far-right Breibart website, was removed from the National Security Council this week amid widespread reports of clashes with senior adviser Mr Kushner, who is married to the President’s daughter Ivanka. During a discussion on the reported in-fighting between Mr Trump's two closest advisers, former Breibart employee Kurt Bardella said the cold reaction of the nationalistic “Bannonoite” wing of the party to the air strikes against Syria is a clear sign they fear their man is losing his influence over the President. The Bannonist wing of Mr Trump's supporters are thought to be mostly opposed to military intervention in Syria because they do not see how it advances his pledge to "put America first". Mr Kushner and his circle are understood to believe it is necessary to punish the Assad regime for its use of chemical weapons – a view Mr Trump appeared to echo in explaining the air strikes. Both men were inside the Mar-a-Lago hotel room where the briefing on the Syria strikes took place, where they are understood to have clashed. 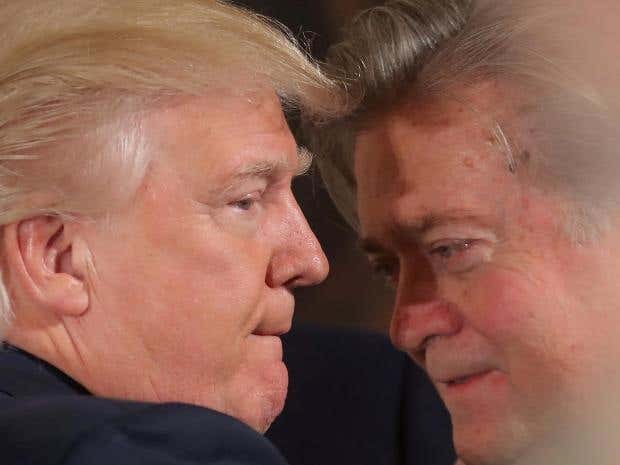 Asked what would happen to Mr Trump’s support from the Breitbart wing if Mr Bannon is given his marching orders, Mr Bardella warned: "It will be open warfare from the outside in. “And all of the sudden the pages of Breitbart, who have been incredibly generous to Donald Trump to say the least, will start turning their fire on him or, at the very least, assign blame saying Trump betrayed the conservative right because of Jared Kushner and liberal Democrats inside the White House have turned them against us. “They’re concerned they are about to lose their link to the West Wing and direct access to the President through Steve Bannon,” he added. “Clearly Steve is under siege right now. The fact that so many on the conservative right so forcefully came out against the actions of the President and strikes in Syria just tells you how much trouble Steve actually really is in. “But they are really going out there publicly, hammering Jared Kushner-aligned strategies because they see Steve could be in jeopardy and could be asked to leave at some point in the near future,” he said. Speaking on MSNBC programme AM Joy with host Joy Reid, former Governor of Vermont, Democrat Howard Dean, also weighed in to attack Mr Bannon. He said: “I don’t know anything about Jared Kushner, but I know about Steve Bannon. “Jared Kushner from the little I know about him is a far better candidate,” Mr Dean continued. Mr Bannon is reported to have called Mr Kushner, who is Jewish, a “cuck” and a “globalist” behind his back. “Cuckservative,” a portmanteau of “cuckold” and “conservative,” has become a popular insult on the right and is used as a sexually and racially charged version of “RINO,” an acronym for “Republican In Name Only.” On its own the word cuckold means a man whose wife has cheated on him, and was used frequently by William Shakespeare. “Globalist” is a term frequently used by nationalist, pro-Trump right-wingers to attack political opponents, but the term has been criticised for carrying anti-Semitic undertones. Asked what would happen to Mr Trump’s support from the Breitbart wing if Mr Bannon is given his marching orders, Mr Bardella said it would get ugly. An official who did not wish to be named was quoted as telling The Daily Best website that Mr Bannon thinks Mr Kushner is “worse than a Democrat”. Outlets including The New York Times reported that Mr Bannon has considered resigning from the Trump team altogether following the failure of two key policies he is believed to have orchestrated – the travel ban against seven Muslim-majority nations and the repeal and replacement of Obamacare. Mr Bannon is reported to have said he “loves a gunfight” when asked about his relationship with Mr Kushner, according to Axios. Mr Kushner is said to be very close to his father-in-law, and has a wide-ranging portfolio of duties in the White House as well as being a senior adviser. This entry was posted on dimanche 9 avril 2017 at 17 h 55. You can follow any responses to this entry through the RSS 2.0. You can leave a response.